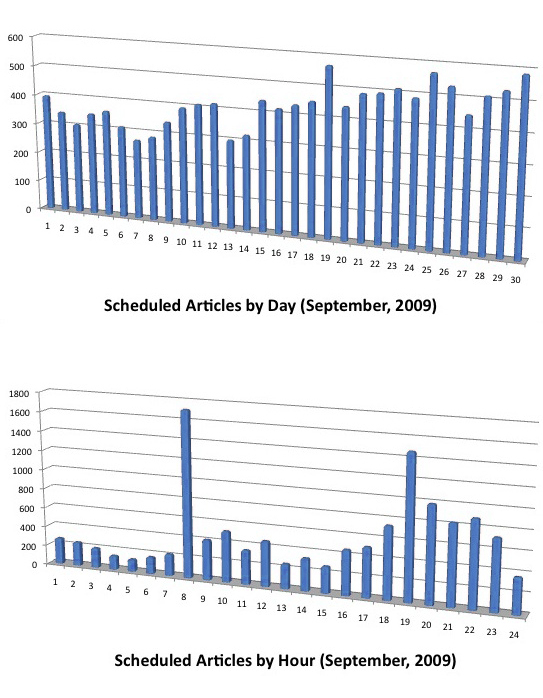 Data clearly shows when EzineArticles Premium Members prefer to put their articles out on the web. In the month of September, 80 new Premium Members came on board. That’s a significant increase in membership and explains the steady growth in scheduled articles over the course of the month. The motivation behind the chosen days of the week and preferred times of day is open for debate. 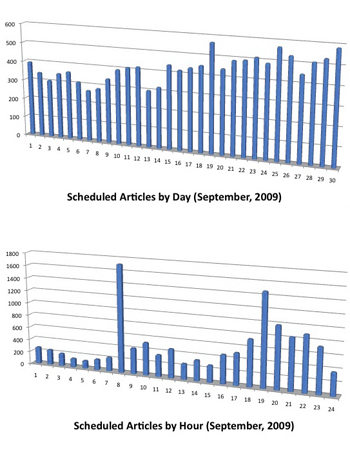 One key benefit of article scheduling that’s not shown in the graphs is the value of sprinkling articles for release over time as opposed to dumping them to the Internet all at once. This strategy keeps fresh new articles going into your article inventory even when you’re on vacation or away from your office. It can also save a significant amount of time when you upload a high quantity of articles at once. The Scheduled Article Release Feature is available only to Premium Members. Surf http://EzineArticles.com/premium/ to discover if the benefits of our Premium membership are right for you now. Do you have some thoughts about why specific days or times are more popular than others? Please leave a comment – we’d love to hear your insights! For me it’s finding the time away from running the business & Mon-Wed are my busiest times, so I like this idea and will use it in the future. Great idea to sprinkle them out over time. The time of day of release is right before (8am) and right after (6pm) the regular work day. Which leads me to beleive that ezine authors are not using their empoyer’s time for article writing. Based on this alone you can safely say that all ezine authors have the highest ethical and moral standards! I am not sure it makes any difference but have always been curious. The elves work 24/7/365 don’t they? Not sure I will believe any theories either. Interested in seeing other thoughts tho. I believe that the release times are because you make a schedule to do certain tasks first thing in the morning and the last thing you do in the evening. I am not sure about Saturday though. Sunday is time you spend with your family. I think members schedule for release late Friday night or Saturday AM with hopes that no other new articles will be published to push theirs out of the way. I don’t think it’s a good reason to schedule on Saturdays if you are ONLY doing it to get an extra handful of views, but feel the better ROI from being Premium to schedule is the ability to upload many articles in one sitting and have them released over time. I am writing all of the time and just submit my articles when I am done with them. Even though I try, the popularity of published articles seems to be totally random. Initially, I thought weekends would be ideal to release my articles but after a year here, I’m convinced it really random. Thank you EzineArticles for providing such a great way to get our articles out to the world. The question is how many are being read. Getting them off in the morning hoping they will be read in the office and another burst in the evening for those who could not read them at work. In my view, it is entirely random- no scientific answer! I do think there is a pattern. Many of us who write consistently (and are possibly self-employed) find mornings to be our most creative. While I do most of my writing in the morning, I often don’t submit until 5 p.m. In addition, many people are writing on Saturdays — 1st thing I do on Saturday morning. Sundays are family days, and, of course, there are still people who attend church. For many of us, our businiess is heavier in the beginning of the week which is why more articles are submitted in the latter part of the week. Your data makes perfect sense to me. Based on my experience, Tuesdays and Wednesdays are better. Hi, i have no idea what so ever.I started writing my first article and it took me all evening and all night,then it was rejected.Bombed out. Thanks for yalls input. I recently signed up for a premium membership and I have decided to try the scheduled postings feature. Right now I am thinking about scheduling five articles per day 8am, 10am, 12pm, 2pm and 4pm. However I was wondering what you think? Is there a better strategy to employ? Is there an advantage to scheduling articles outside of regular business hours since the editors are gone home for the night? Are scheduled posts still eligible for placement on the recent articles page and the home page? Depends on too many variables to list. Best if you just test and determine for yourself what feels right.